Of Course! 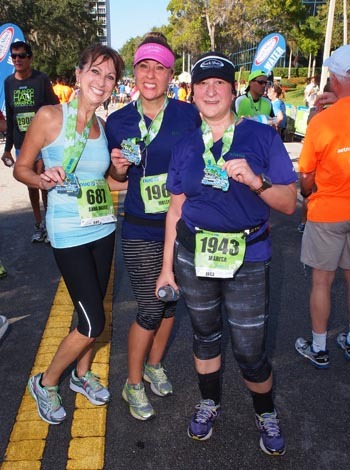 The Orlando Half Marathon and 5k is for athletes of all speeds. Please note: Due to city road closure and traffic requirements, half marathon participants MUST maintain a pace of at least 15:00 minutes per mile (or faster). Are there any age requirements to participate? To participate in the Orlando Half Marathon one must be 14 and 8 years old to participate in the 5k. Click here to sign up to volunteer! Volunteers are the backbone of all our events and are always needed and welcome. You can switch distances for a small fee. Click here for details. What if I register and then become injured or am unable to attend? There will be NO refunds or transfers of entries from person-to-person. You can defer your entry to the next year for a small fee. Race packets will be available to pick up at Track Shack (1104 N. Mills Ave. Orlando, FL 32803). Race packets will also be available on race day at the race site start starting at 5:30 a.m.
You can have a family member or friend pick up your race packet as long as you gave them the permission. What is included on my personal bib? Your personalized bib will include your first name and your race number. Must register by Sept. 30. The Half Marathon and the 5k will be timed using the ChronoTrack timing system. A ChronoTrack B-tag will be located on the back of the race bib. Do not remove, bend or break the ChronoTrack B-tag. Without the B-tag, your official time WILL NOT be recorded. Where are the aid stations and what is being served? There will be nine Water/Gatorade stations, about every 1 1/2 miles. Are MP3 players and/or strollers allowed on the course? MP3 players with headphones/earbuds ARE allowed on the course. For the safety of yourself and the other participants, baby joggers, strollers, baby carriers, baby backpacks, inline skates, motorized scooters, bicycles, skateboards, canes, crutches, walkers, walking sticks and animals of any kind are prohibited from the course. The race will be held rain or shine. If there is lightning in the area the race will either have a delayed start or, depending on the intensity of the weather, be cancelled. The determination will be made by the Event Management staff. Limited parking along side streets; parking garages are located at the corner of Rosalind St. and Robinson Street, as well as various other locations throughout downtown Orlando. Parking garage rates may apply. How do I meet my family/friends after the race? A site map will be posted on the website. Review the site map and plan for a designated meeting spot and time. Communicate your estimated finish time. After I park, how can I get to another part of the course to cheer on my friend? Don't have a bike? Get an hour free when you sign up with Juice Bikes! Wheelchair athletes are invited to participate in the OUC Orlando Half Marathon or 5k. To participate in the half marathon or 5k a wheelchair athlete may be push rim or hand cycle and must wear a helmet. Hand cycle wheelchair athletes will be in the exhibition category, are non-scored and may not pass the lead cyclist. Awards are given to the overall male and female push rim athlete. For more information on wheelchair participation, please email doug@trackshack.com. What accommodations are offered for visually impaired runners? In most situations and within an appropriate time frame, the organizing committee can pair a visually impaired runner/walker with a guide to participate in the half marathon or 5k. Please email chris@trackshack to request this accommodation. What accommodations are offered for disabled spectators at Lake Eola? Lake Eola Park is wheelchair accessible with handicap restrooms and wheelchair accessible sidewalks. There is also a wheelchair-accessible swan paddle boat, an attraction at Lake Eola Park. Handicap parking is available in area parking garages.